LAKE CHARLES, La. — It was another successful day on the diamond for the University of Arkansas softball team, who notched two more wins on Saturday (Feb. 9) after taking down Samford in 6-1 fashion and securing a 5-0 decision over Lipscomb. The Razorbacks move to 4-0 on the season, outscoring opponents 24-4. Arkansas will face one last opponent in the Cowgirl Classic, seeing a familiar face in Campbell University. The Razorbacks and Camels, who met earlier this weekend in a 7-3 victory for the Hogs, will share the diamond once more on Sunday morning (Feb. 10) at 9 a.m. (CT). 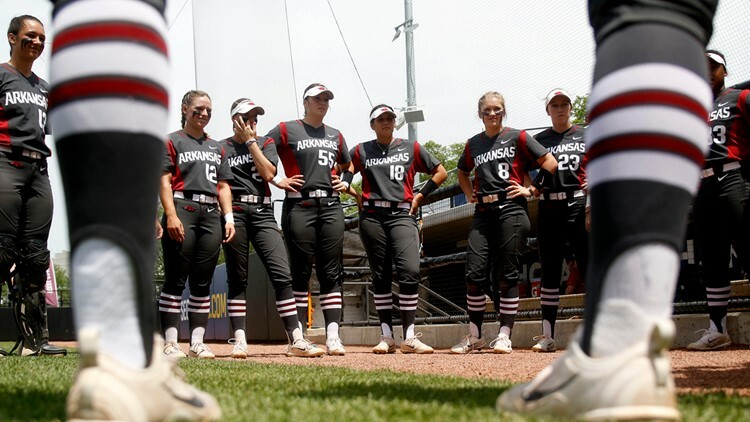 The Razorbacks did not trail for a single inning on Friday (Feb. 8), and they weren’t letting that streak end on Saturday, jumping out to a quick two-run lead after Ashley Diaz fired off her third double of the season into right center field. Diaz scored Danielle Gibson on the hit, who reached on a hit by pitch call earlier in the inning. Now with Warrick on third, who’s single would put her on base just before Diaz’ hit, and Diaz on second, Kayla Green would draw a walk to load the bases full of Hogs. Sophomore Linnie Malkin stepped up as the designated player, and reached first base on balls as well, pushing Warrick across the plate for another Arkansas run. Both teams would go scoreless through the second, third and fourth innings, and after Samford threatened with two Bulldogs on base in the fifth, the Razorbacks had to respond with another offensive spark. Gibson would lead off the fifth inning with her first home run in the cardinal white, taking the first pitch over the right field wall, and giving Arkansas a little more breathing room on the scoreboard. Only one inning later, Jackson kicked off the sixth with a single to shortstop, turning on the jets and beating out the throw from Samford. Malkin finds her way to first once again, this time with a pitch to the leg, Carley Haizlip would take Malkin’s place on first and with a perfectly executed sacrifice bunt from Haydi Bugarin, Haizlip and Jackson were now in scoring position. With one out on the board, Maggie Hicks and McEwen would go back-to-back with singles, driving in a combined three more runs. Samford would shut-down Arkansas’ shut-out attempt, with one run scored off a Razorback error and a single back to winning pitcher, Autumn Storms, but the Hogs defense held off the comeback attempt and held onto a 6-1 win over the Bulldogs in the end. Once again, the Razorbacks wasted no time putting runs on the board, firing off five runs over the second and third innings, sparked by a single by Jackson. Jackson’s hit was followed by the same from Malkin, and now with runners on first and second, catcher Nicole Duncan laid down a sacrifice bunt- moving Jackson and Malkin into scoring position. Hicks approached the plate and soared a line drive into left field, Lipscomb fumbled the catch and with the error Hicks had the chance to round two. The Lady Bisons were able to catch Hicks at third, but not before the End Rock, Ark. native earned two RBI with the scores of Jackson and Malkin. Back at the top of the order, Gibson started the three-run inning reaching first base with a walk and advanced to third with a key double from Warrick. Diaz’ followed with a double of her own, her fourth of the season, scoring both Warrick and Gibson on the fiery hit up the middle. Haizlip would enter and take Diaz’ place on second. Jackson singled through the right side, loading the bases with Hogs for Malkin. The Lady Bisons would make a defensive change in the circle, but the Razorbacks had no intentions on slowing down. Malkin and Duncan would reach base on a walk and hit-by-pitch call respectively, scoring Haizlip in the process. Haizlip would be the fifth and final run for the Hogs, but that’s all they would need to take down Lipscomb, 5-0. Starting pitcher Mary Haff pitched a complete game, for her 31st win of her career- moving her into seventh place in the all-time career wins.